Is North Idaho Orthopedics and Sports Medicine (NIOSM) a preferred provider for my insurance? Because we participate with multiple groups, NIOSM is a Preferred Provider for most insurance plans. A PCP is your Primary Care Provider (Physician) – your family medicine doctor. The name of your PCP appears on your insurance card. A referral is a process of informing the insurance company when you require care that your Primary Care Provicer (PCP) is unable to provide (a specialist for example). Some insurances require you ask for permission before seeing a specialist. 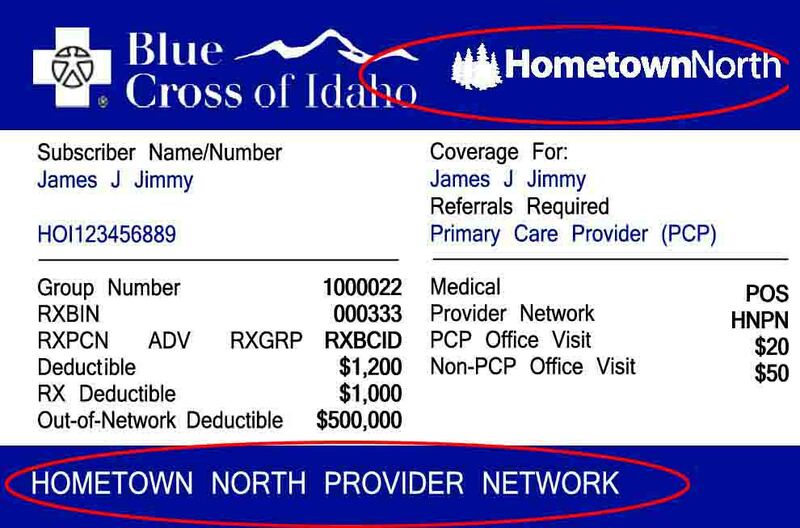 If you have Idaho Blue Cross insurance through the exchange , and your insurance card looks similar to the one below (Hometown North), Blue Cross requires you to select a primary care provider AND requires you to have a referral from that primary care provider before you schedule an appointment with our specialists at NIOSM. If you do not have a referral from your primary care provider, Blue Cross considers your exam/treatment “Out of Network” and will not cover any portion of the appointment until you have met their ridiculously high deductible (see “Out-of-Network Deductible” example on the card). Ridiculousness of deductibles may vary. Blue Cross Hometown North says before you can have your appointment with one of our specialists at NIOSM, you’ll need a referral from your PCP. Blue Cross Hometown North referrals take 2 – 24 hours for in-network referrals, and 3 to 10 days for out-of-network referrals. For more information from Blue Cross of Idaho, click here.